We believe that mental health and spiritual health are closely connected. It is common for a person to identify a spiritual issue while working through treatment for an addiction or emotional difficulty. It is also common for a person to experience a block in his or her spiritual life, and then discover some psychological difficulty or relationship issue that is contributing to it. Spiritual Direction is a private and confidential one-on-one meeting, similar to counseling in this way. Sessions are generally a 60 to 90 minutes long, once a month at a conveniently planned time and date. Spiritual Direction can be a few consultations, or last many years. 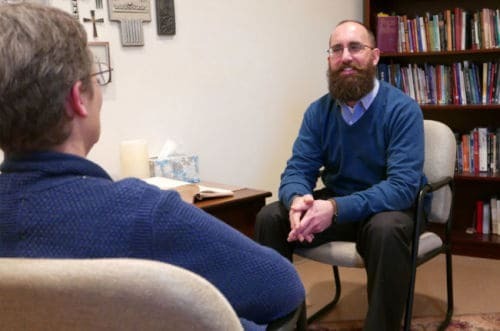 There are some similarities to counseling, but the focus is on spiritual matters. We believe that spiritual growth/healing and psychological growth/healing do overlap. Some people contact Gratia Plena and begin in counseling, but then move to spiritual direction after the counseling issues are resolved. Others start with spiritual direction and realize the need for counseling as issues are being discussed. Some of our clients meet with a counselor and then also with a spiritual director in alternating visits.